Would love Perak or Kitchee to cause a surprise and give us something different. Perfect. I was hoping for Shanghai later in the group stage. I can finally (a) visit Shanghai, (b) tick ‘away ACL Sydney game’ off my bucket list. I’d feel decent about this group if we came up against them. We’re absolutely screwed, but hopefully it’s fun. …and if we qualify out of the group stage our Round of 16 opponents will be either the 2nd best Japanese, 2nd best Chinese or the best Korean team. How can the premiers in the best four Asian leagues all be In one half of the East Group? Meanwhile in groups E and F, the strongest teams are 2nd best Chinese, the 2nd and 3rd best Korean team and MVFC. I guess we don’t enter this competition to play easy teams, but it seems we play two of the favourites in every group we draw. Hopefully the AFC allow us to wear sky blue this time! Should be a great challenge for us and hopefully we can escape the group of death. Does anyone know when will we find out our final opposition? What’s the feeling on our home ground for these shenanigans? Assuming Kogarah and Leichardt are out because of the hills. Section 38 of the regulations state that everyone has to be seated, which to me says that we could play at Kogarah we would just shut off the hill. Austadiums says seating capacity is 8.5k. I imagine Leichhardt would be even less. WIll Parramatta Stadium be ready for the ACL comp? Late April 2019 so we could only potentially play the last game at Parramatta. Although it would be funny for Sydney FC to play the first football game at the new stadium. Us playing the first football match at the new Parra stadium would be superb and I really hope the club tries to make it a reality. 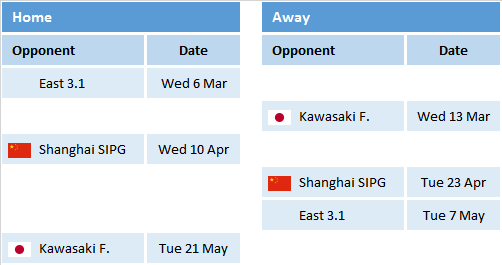 6 games in 22 days in April is tough, but only 1 is outside of NSW (in Shanghai to be precise). Also Shanghai is a direct flight, which is nice. Toughest stretch will undoubtedly be Finals week 1, then away in Asia midweek, the Finals week 2 on the weekend. We really want to be in the top 2 so we don’t play week 1. I thought that they dealt with the fixture congestion issue last season? Why are we going back to playing games on the weekend between mid week games? There is one weekend off, March 9-10, so our first 2 ACL games have no HAL in the middle. Also that game on 18th April is on a Thursday, giving a 5-day break until the ACL match. I think this is pretty similar to last season. There was just one weekend off then. We just really need to come top two or we’re farked.